Total income for August came in at $7,467.48. Expenses saw a huge jump again up to $8,118.65; however, I'm excited to see that because that was due to extra debt payments. During August we made $5,000 of extra payments on the A/C that we had to replace and that debt will be gone during September. Unfortunately that led to use being cash flow negative to the tune of $651.17 for the month, but I'll gladly take it. As soon as the A/C debt is gone that will be $300 of cash flow that we can put towards the car loan that we have, *Ooops! *, which I expect to also be paid off before the end of the year. With negative cash flow for the month that meant we had a -9% savings rate and -14% savings rate based solely off my work income. Excluding the $5,000 in additional debt payments things look a lot better. Expenses would have dropped down to $3,118.65 which is still high, but in the neighborhood of recurring monthly expenses this year. That would have pushed us up to $4,348.83 of savings for the month and a 56% savings rate based on work income alone. Truly passive income, dividends and interest, totaled $316.48 during August which was about a $20 increase from May. *Dividends are from my taxable accounts only. 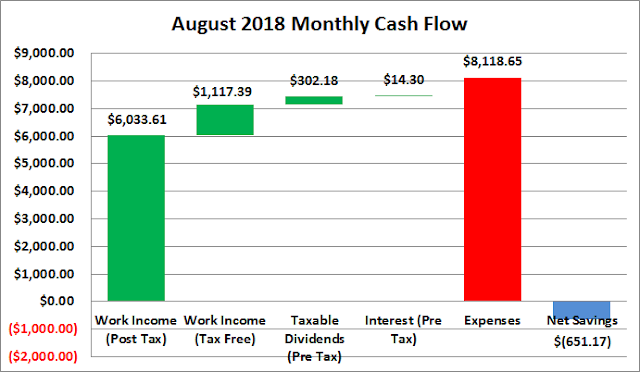 Based on August's spending the passive income for August covered 4% of expenses. Excluding the extra debt payments and the passive income covered 10% of expenses. Thus far in 2018 I've totaled $4,077.59 from income outside a traditional day job. 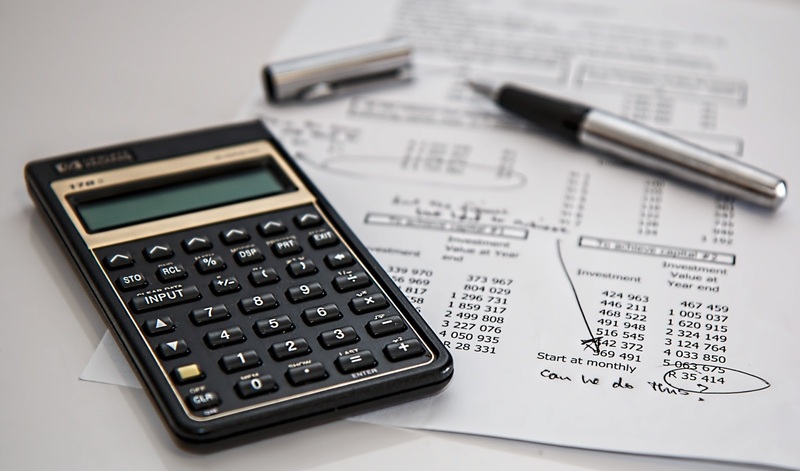 August finally saw our debt reduction plans kick into gear with $5,000 of extra payments. Those extra payments brought one of the debts down from $6,200 to $900. Even better is that during September the 1st debt will be completely gone. Even better than that is that it will free up $300 extra per month to put towards the car loan that we have. Last month I thought that it'd probably take us until the end of the year to fully pay off both of these debts; however, now with an end in sight and a solid income to help support the debt reduction I want to get even more aggressive on the debt pay down. We currently owe in the neighborhood of $8,325 on the car loan after the extra payments we've already made during September. That means we have to average $4,162.50 in total payments per month during October and November to be done before December. That might be a bit tight but I think it's very doable. And what a Christmas present that will be!